The Boxing Truth®: Has Hopkins Reached The End Of The Road? Bernard Hopkins has built his Hall of Fame career on his ability to defy odds and accomplish goals that few have attempted. The only man in Boxing history to completely unify a weight class by unifying the world championships of the IBF, WBC, WBA, and WBO while setting the all-time record for most successful title defenses in the history of the Middleweight division compiling twenty successful title defenses from 1995-2005. Hopkins’ historic reign atop the Middleweight division alone secured his status as a future Hall of Famer. In an era where world championships are won, lost, stripped, or relinquished for various reasons Hopkins showed, despite the various political elements that surround the sport that a fighter can not only win a world championship, but become the one and only champion. Hopkins is a true throwback to an era where fighters took on all comers and there was one recognized champion per weight class. Although his place in the Hall of Fame was cemented with his historic reign over the Middleweight division Hopkins continued to set goals and accomplish feats. Not only would Hopkins go on to win two separate world championships in the Light-Heavyweight division, a weight class fifteen pounds above the Middleweight division, he would also make history in the process by becoming the oldest fighter in the history of the sport to win a world title at age forty-six in 2011. Hopkins would incredibly top his own historical feat after losing the WBC world title in his rematch with Chad Dawson in 2012, by defeating IBF champion Tavoris Cloud in 2013 to break his own record by becoming a world champion at age forty-eight. On November 8th at Boardwalk Hall in Atlantic City, New Jersey Hopkins entered the ring to unify his IBF/WBA Light-Heavyweight world title against undefeated WBO champion Sergey Kovalev. Kovalev, a fighter with a career knockout percentage of nearly 89%. Kovalev would not be an easy step in Hopkins’ attempt to unify the Light-Heavyweight division. Kovalev would drop Hopkins in the first round with a right hand. Although Hopkins was able to get up from the knockdown, it was Kovalev who would control how the fight would be fought, consistently pushing Hopkins back and outworking him in every round. Hopkins would occasionally land punches on the thirty-one year old Kovalev, but could not offer sustained offense and for the first time in his career Hopkins was dominated in losing a one-sided twelve round unanimous decision. Hopkins was however, successful in taking Kovalev, who had only previously fought as far as eight rounds a full twelve round distance. The question coming out of this fight for Hopkins is whether or not his age has finally become an issue for him. Hopkins who landed only 65 of 195 punches during the twelve round championship bout seemed hesitant throughout much of this fight. Was Hopkins’ sporadic offense attributed to the fact that he is forty-nine years old and could not consistently let his hands go or was it more due to a respect for Kovalev’s punching power and not wanting to put himself at risk of potentially being knocked out? One should remember that Hopkins after all, is a tactical chess player as a fighter and has always looked to capitalize on an opponent’s mistakes. The feeling that this observer had as I watched this fight was that perhaps Hopkins’ goal was to fight a more defensive fight than is his norm in trying to make the younger man, who is noted for his punching power expend more energy by looking to trap Hopkins. Although Kovalev clearly dominated this fight and outworked Hopkins in every round, Hopkins did make the younger man miss often as Kovalev landed 166 of 585 punches thrown. To Kovalev’s credit however, he was able to keep the pace he established as the fight progressed and did not seem to fatigue as the rounds went on. The pace of a fight was really one that seemed more suited for Hopkins, a tactical measured pace where Hopkins typically excels. In this fight Hopkins simply could not let his hands go and that was simply the story of this fight. Hopkins allowed Kovalev to walk in often unimpeded, pinning him against the ropes as he offered little resistance. As for what is next for Sergey Kovalev, an anticipated showdown with WBC champion Adonis Stevenson may likely be a goal for 2015. Before any talk of a fight to determine an undisputed world Light-Heavyweight champion can take place, Stevenson will defend his title against Dmitry Sukhotsky on December 19th in Quebec City, Quebec, Canada. A question however, that both Boxing fans and experts alike are likely pondering is whether or not Hopkins’ loss to Kovalev is the end of the road for a true legend of the sport. Although Hopkins had suffered six losses in sixty-five previous fights prior to facing Kovalev, there has always been some debate as to whether or not Hopkins won those fights. This time however, Hopkins clearly lost this fight and for the first time took a beating throughout. To his credit, Hopkins still showed the ability to take a punch and stood up to what Kovalev had to offer excluding the knockdown in the first round. Whether or not we have seen Bernard Hopkins compete for the last time is only a question that he can answer. 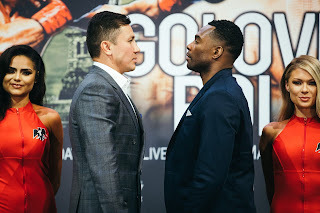 One idea that some have suggested is that Hopkins could make another attempt at a world championship and perhaps another run at attempting to unify the Light-Heavyweight division by possibly looking for a potential fight with Adonis Stevenson. If Stevenson successfully defends his title in December and assuming that a clash between Stevenson and Kovalev is not in the immediate future, Hopkins may get the nod providing he decides to continue to fight. Anything is possible and it would not shock me if a fight between Stevenson and Hopkins were made. In this observer’s opinion however, Bernard Hopkins’ legacy and status as a future Hall of Famer and legend of the sport is more than secure. Whether or not Hopkins decides to fight again will be up to him, but in my eyes he has nothing left to prove.